Keeps you comfortable and your valuables safe. Stylish enough to wear out, but keep it undercover--over shoulder, around neck or about your waist. It's much easier than you might think for a quick thief to separate you from your valuables! Silk makes this the ultimate neck pouch - neck wallet for comfort and durability. Breaths naturally and dries quickly. 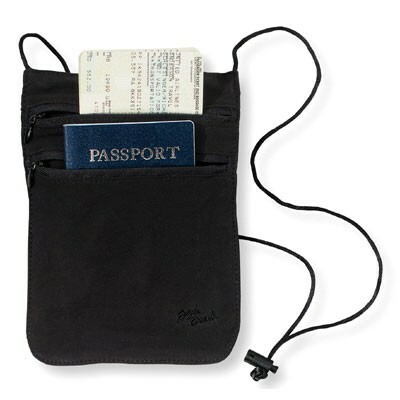 Three compartments to organize your travelers checks currency, passport, credit cards with one clear pvc inner waterproof liner. Softseam, no-ravel construction with hidden nylon zippers. Soft adjustable Rayon neck cord. Choose colorfast black or tan.